Combine the soy sauce and sesame oil in a small bowl. Set aside. Heat large skillet (or wok). Pour oil in the bottom. Add in ham, white portion of the green onions, and the red pepper. Saute until the vegetables are tender. Remove from pan and set aside. Add cold rice to the pan. Cook until heated through. Push rice over to one side of the pan, and add the beaten eggs. Scramble fry the eggs, until cooked and then add into the rice mixture and combine well. 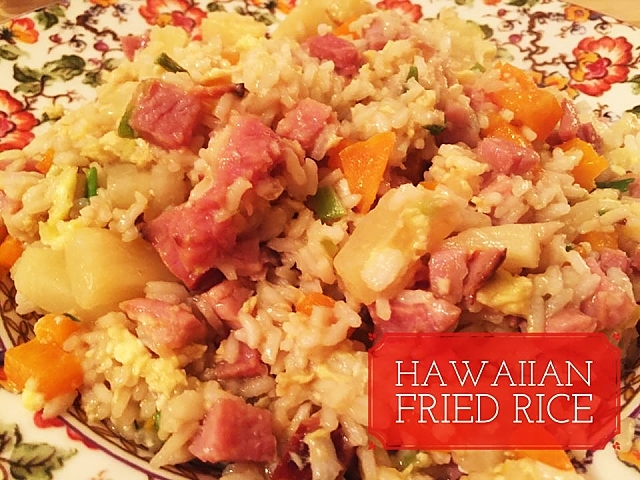 Re-add the ham and vegetable mixture to the rice, along with the soy sauce and sesame oil. Add in pineapple tidbits and remaining green onion pieces. Saute, tossing to combine all of the ingredients together, continuing until they are heated through.